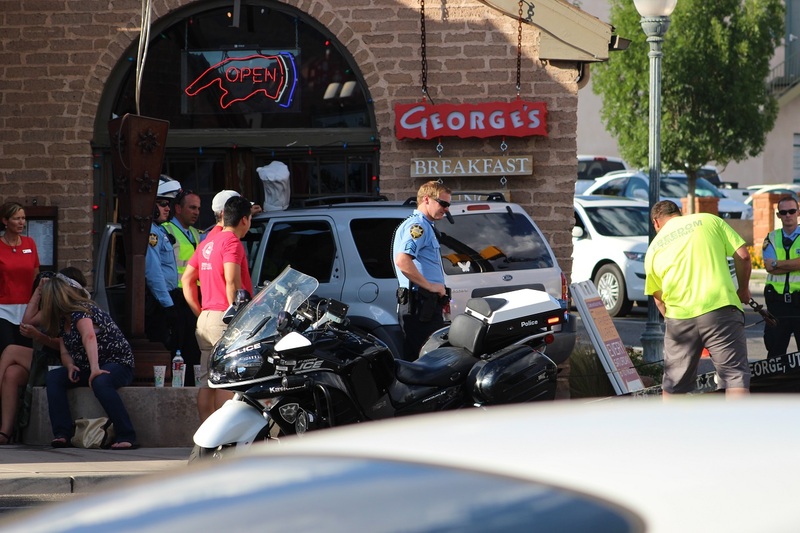 ST. GEORGE – Dinner was interrupted at George’s Corner Restaurant Wednesday evening as a three-car collision sent one vehicle into the building and two people to the hospital with minor injuries. Just before 6:30 p.m. officers and emergency personnel were dispatched to a reported three-car collision in the intersection of West St. George Boulevard and North Main Street. 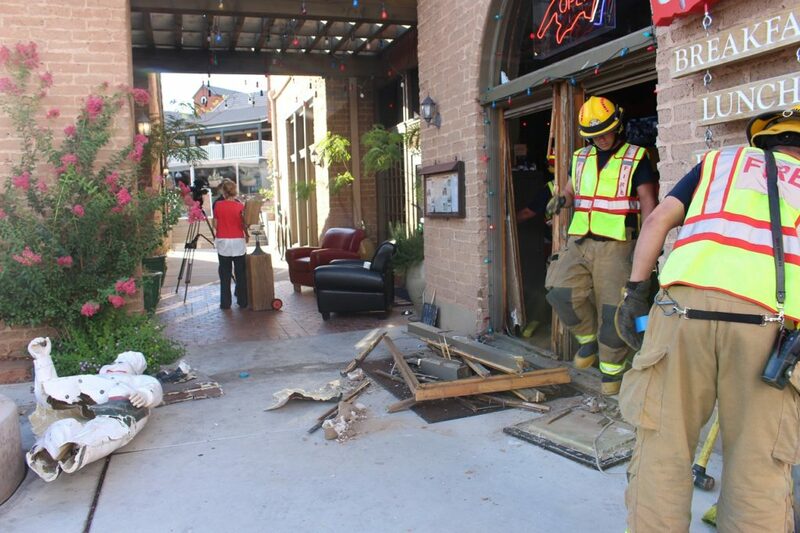 Upon arrival firefighters found a silver Ford Escape that was partially lodged inside the St. George Boulevard entrance to George’s Corner Restaurant, St. George Fire Capt. Brad Esplin said. Four people were involved in the collision that included a red Jeep Wrangler, the Ford Escape, and a gray Toyota Tundra. Two people were transported with minor injuries, Esplin said. The silver Ford Escape was traveling south on North Main Street and approaching the intersection of West St. George Boulevard. 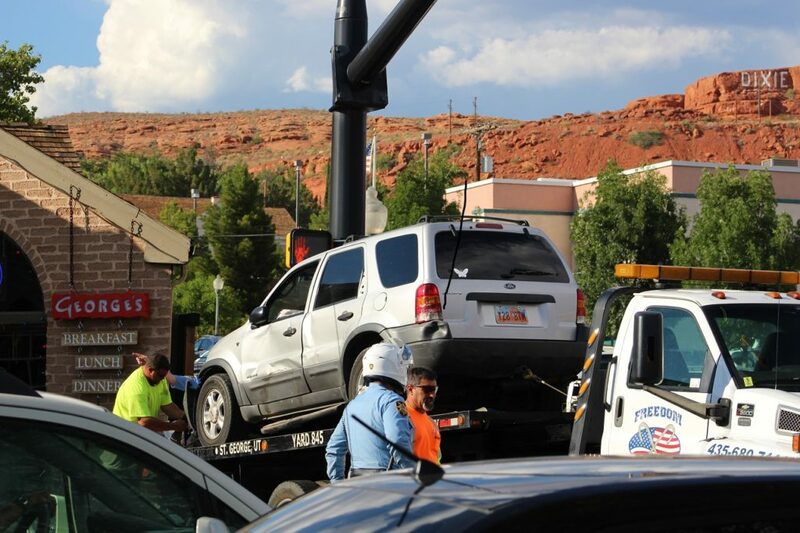 The Ford’s driver ran a red light, striking the Jeep in the intersection, St. George Police Sgt. Tyler Cowan said. As the Jeep spun around it struck the Toyota, sending the Toyota back into the Ford and pushing that vehicle into the front corner of the restaurant, he said. 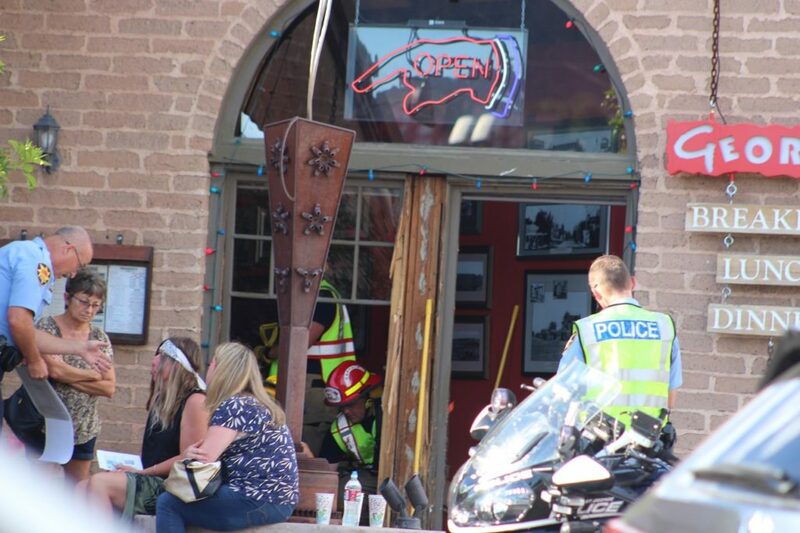 Chet Norman witnessed the crash as he was eating dinner on the outside patio of The Pasta Factory. 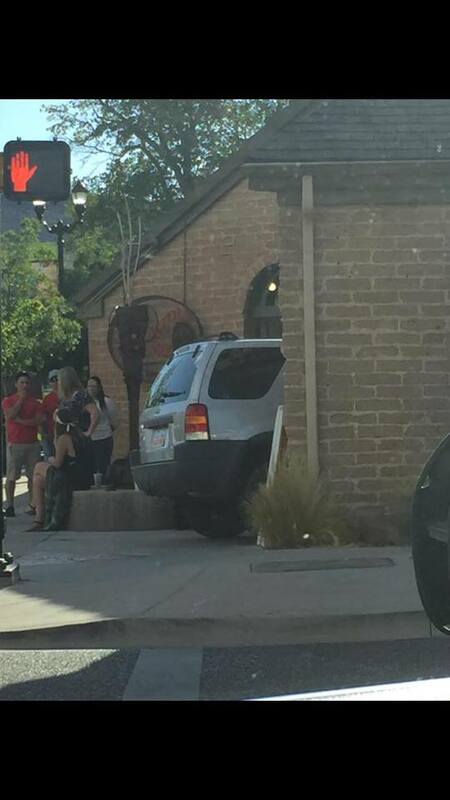 The Ford crashed into the restaurant’s entryway, he said. 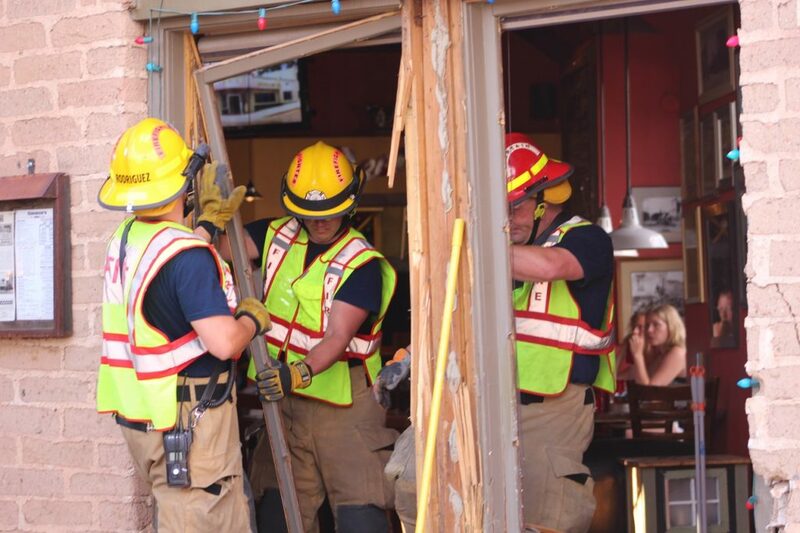 The collision caused some damage to the building, Esplin said, but after a preliminary inspection the restaurant was found to be structurally safe. 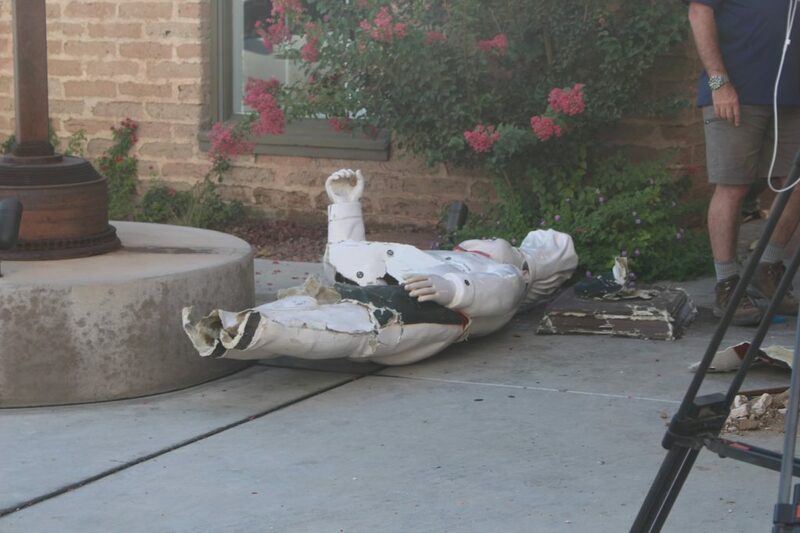 The Ford had plowed into a glass entryway, toppling and pinning the store’s mascot chef statue that normally stands at the entrance to greet customers. Norman said a man in the Ford told him that the brakes in his vehicle seemed to fail immediately after his car was struck by the Toyota. Although he didn’t see the collision unfold out on the street, Norman said he clearly saw the Ford smash into the restaurant. That’s when he snapped some photos to share with friends on his Facebook feed and to send to St. George News, two of which are published in this report. Patrons seemed unfazed by the commotion and continued eating their meals as emergency personnel tended to the scene. Traffic was affected as the intersection was blocked when the crash occurred, but officers were able to direct traffic around the site until the vehicles were towed. Firefighters then began the cleanup process of clearing out glass and debris that littered the area. No other injuries were reported, Esplin said, and the two occupants that were transported were conscious and stable. 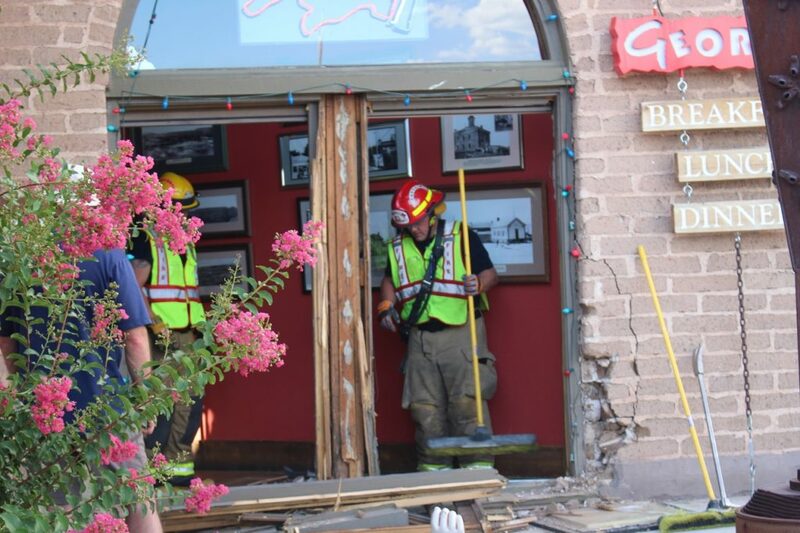 The St. George Police Department, St. George Fire Department, and Utah Department of Transportation’s Incident Management Team responded to the scene. A statement from law enforcement was unavailable at the time of this report. Sounds like the Ford driver had something really important going on so he ran a red light . Now that important thing is totally eclipsed by the giant mountain of bills coming his way . Sounds like 3 cars were totaled , a restaurant with $$$$$$$ damages & hospital bills for 2 people . Running red lights can have extremely expensive consequences . He might end up in bankruptcy since his insurance won’t cover bills due to illegal actions . Ford driver’s brakes seemed to fail? Probably not. Probably Type 2 right foot pedal error. Some facts and a question. Per DOT and NHTSA right foot pedal errors are responsible for 18,000 crashes every year in parking lots alone. That’s a death rate of 30,000 over the last 50 years. If these errors included roadways, cyclist and pedestrian crashes, this death rate would be 5 times as much. There is zero science to support the use of right foot braking on automatic cars but we have been forced to do it and set up to fail as part of the Right Foot Braking Epidemic. Question. Why are those in charge of driver legislation and training so opposed to a scientific study comparing right foot braking on automatic cars with the safer left foot braking method? Perhaps we should ask them. Oh you’re confused because it’s not a comment about your Zionist expertIse. ! LOL ! I just spent a few days in StG and noticed a lot of drivers are color blind. Wow you are absolutely amazing ! you should have your own TV show. !